Although the Winnipeg Jets did not hoist the Stanley Cup above their heads this year, there was a clear winner this playoff season: Winnipeg itself. Because our Jets were flying so high these playoffs, Economic Development Winnipeg (EDW), alongside multiple other stakeholders including True North Sports + Entertainment, the Manitoba Hotel Association, the Downtown BIZ, and the City of Winnipeg wanted to provide a venue for Winnipeggers to celebrate their team and their city. We knew that the eyes of every hockey fan on the continent would be on our community, especially if our team found themselves in a deep playoff run. As those eyes turn to our city, we wanted to make sure they saw the very best Winnipeg has to offer. This led to the creation of the Winnipeg Whiteout Street Parties. The experience of hosting these parties was not always simple, and at times we had to run at breakneck speeds. After our first event nearly reached our capacity of 6,000, we knew we had to grow very quickly to meet anticipated crowd demand. By the time the Western Conference Final began, our event footprint spanned nearly six full city blocks with a capacity of 27,000. 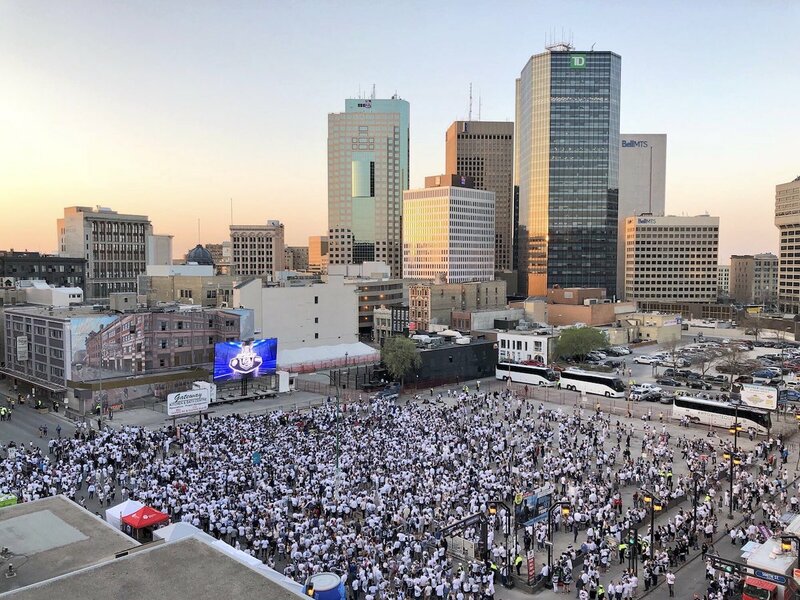 We had to ship in screens from as far away as Edmonton to accommodate the number of fans who wanted to watch the games live on the streets outside of Bell MTS Place. As successive events grew in size, we were increasingly aware that attendance could outstrip capacity. As a group, we came together to find a solution. The end result was the implementation of a ticketing policy – a decision that was not popular, but was necessary to be able to provide a safe celebratory atmosphere for attendees. The vocal passion of fans was heard during this process, and will be factored into any future Winnipeg Whiteout Street Party planning. The end result, however, was a stunning success for our city. We've seen Winnipeg placed on a North America-wide stage as a result of these street parties. With a spotlight on us, we rose up and showed how charismatic, energetic and passionate our city is. From Nashville to New York, and from Las Vegas to Helsinki, people are taking note of Winnipeg, its energy, and its people. No longer being labeled as a city of only potholes and mosquitoes, people are looking at us in a whole new light. With that new reputation comes long-term dividends for our city. When EDW meets with outside businesses, one of the first things we do is sell our city. Part of our mandate is to promote Winnipeg and tell our story, as a way of attracting jobs and capital investment to our city. It’s been a long time since our city has seen such focus, and we are working to leverage this into the future. Our city is earning a new reputation for itself, as an energetic and exuberant space, with a booming downtown and a celebratory atmosphere. We can show the world what a great place Winnipeg is to live, work and play. Part of EDW’s job is promoting Winnipeg to a worldwide audience – these Street Parties have done a better job of this than we could ever have hoped to achieve on our own. Through the first two rounds of the playoffs alone, nearly 400 news articles were written about what was happening on the streets outside of the arena, with an estimated earned media value of over $2.2 million and a viewer reach of nearly 234 million. Our city has been featured in the New York Times, the Globe and Mail, Bloomberg, and more – with the focus of many of these articles being about Winnipeg’s potential for economic development and growth. Winnipeg is used to thinking of itself as a hidden gem, but we’re not so hidden anymore. Now, we’re the talk of the continent. More importantly, it’s what people are noticing that is having a long-term positive impact on the reputation of our city. The Winnipeg Whiteout Street Parties confirmed Winnipeg’s reputation as a modern, energetic and cosmopolitan city. We are world-class, and we have the passion to match it. The positive energy resonating throughout Winnipeg over the past few weeks is contagious, and much of North America has taken notice. Let’s continue to show them why our city deserves the attention it’s getting, and constantly remind them of the now-famous words of Jets star Patrik Laine: “Winnipeg is good”.